Why are Drones good for Tree Surgeons? 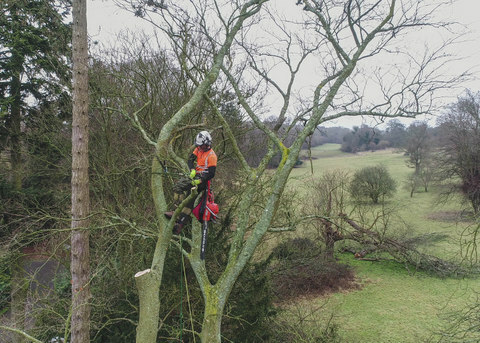 It is becoming increasingly popular for tree surgeons to use drones to capture images of the specialist work that they do as there is no other photography option that allows up close and personal images captures of these guys at work! Who was the work for? I had the pleasure in working with Creative landscapes and Tree Care who are based in Waterlooville in Hampshire. I conducted an all-day shoot for them arriving on site at 0700 one Sunday morning in February 2018 to capture the felling of a large Beech Tree using my DJI Phantom 4 Professional. This drone was perfect for the job as the Inspire would have been too large as the space to manoeuvre the drone between the other trees in the area was limited to say the least! It was a really enjoyable shoot, Ian who owns the company was specific in what he wanted and the shoot involved both photography captured on the ground with my Nikon D750 SLR, My DJI OSMO and of course the Drone. During the site survey it became apparent that the site was very close to the limit of the CAA Drone Code of not Flying within 150m of congested areas, fortunately the closest occupied buildings and road was 157m away from the site. Close but workable! Once the crane team and tree surgeons had been briefed about what to expect I took to the air. It was a lesson in battery management as all 4 batteries I have for the Phantom were in constant use and in a charge cycle all day. Shots obtained included circular panning shots around the tree, before and after overhead images and close up of Ian hard at work in the tree. Almost every major limb was videos at the tree was brought down. A totally of 53 Video Clip and over 55gb of 4k footage captured. It was an excellent shoot and Ian and the team were outstanding and made very light work of the tree. Other shots obtained included images of the Chipper in action, the Crane lifting out the branches and main trunk of the tree and even a cheesy shot of the team sitting on the log at the end of the day. A final plug for Ian and his team! I would highly recommend Ian and his business Creative Landscapes and Treecare and if anyone who is reading this would like to capture similar drone images then please do get in touch.. the Video edit is on its way!